Ulmstead Estates, a community of approximately 359 homes, is situated just north of Annapolis on a peninsula jutting into one of the most picturesque parts of the Magothy River. Picnicing at "The Point", the community beach, residents can watch the ships go up the Chesapeake Bay, view Dobbins and Gibson Islands, and enjoy magnificent sunsets over the water while children are swinging and teens playing volleyball. For the boaters there are two marinas with 110 slips and a boat launching ramp. The community offers four lighted tennis courts, a barn that has stable facilities for 12 horses and an upstairs community center, and a swimming pool fielding a winning team. For adults, there are numerous community parties (Halloween, New Years Eve, 4th of July, etc), tennis leagues for the beginner to advanced player, and civic functions. For younger members there are Christmas, Halloween, Easter parties, beach camp, girl and boy scouts, weekly children' play groups and other events. Currently, there is currently 1 home listed for sale in Ulmstead Estates which is a 6 bedroom, 4 and 1/2 bath colonial listed for $2,165,000. 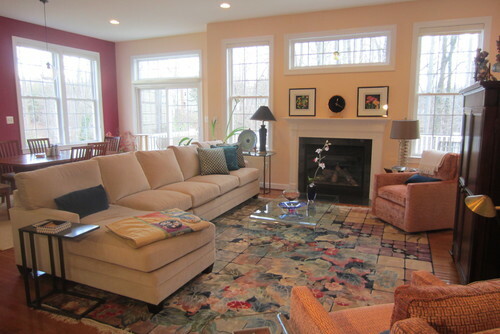 This weekend, there are fifteen waterfront Open Houses in and around Annapolis. On this list is a beautiful waterfront estate with 4 bedrooms and 3 1/2 baths in Bay Ridge. This home features awaterside pool & commanding water views of Lake Ogleton to the Bay Bridge. Extensive hardscape & striking new entrance enhance this Ranch style home w/ vaulted ceilings, open fl plan,hrdwd fls, stone FP, main level master w/ waterside deck! LL w/ sliders, 2nd kitchen, rec room, bedroom, full bath & media room. Private pier & 75 feet of waterfront. It's listed for $2,250,000 and open Saturday, July 23th from 1PM to 3PM. Currently there are 120 properties in our area for $1M or higher. Property featured above: 803 Coachway in Annapolis, MD, 21401. Click here for more information. Breathtaking sunrise views of the Severn River from this beautiful custom home. Over 12,332sqft, exquisitely renovated in 2008. Gourmet chef's kitchen, home theatre, gym, sauna and steamroom. Gorgeous gunite waterside pool with custom inlays and fountains, spa, two outdoor rooms, and gas fireplace make this an entertainer’s dream. Private deep water pier with 3 slips and 2 lifts. Currently there are 36 waterfront properties for sale in our area that have come on the market in the past 30 days. They range from a 2 bedroom, 2 bath condo in Shearwater on Spa Creek for $424,900 to a 6 bedroom, 7 bath French County estate in Wimbledon Farms on the Chesapeake Bay for $5,995,000. Catherine M. Lowe, ASID: Interior Planning & Design in Annapolis, Maryland, is a partner you can trust to facilitate your desired results with her knowledge and experience. Prior to launching her own company, her 30 year career has included work in top award winning Architectural Firms in the Mid-Atlantic region. Currently, there are 13 homes for sale in Murray Hill, ranging from a colonial for $425,000 to a traditional style waterfront for $2,475,000. In the past 30 days, five homes have sold in Murray Hill. Currently there are 122 properties in our area for $1M or higher. Property featured above: 3355 Harness Creek Rd in Annapolis, MD, 21401. This French Country Estate boasts sweeping ever changing Chesapeake Bay views. Watch the moonlight dance on the edge of the private beach. Enjoy the tranquility amongst abundance of nature. As I browsed through the recent most-popular pool photos on a hot day, it was easy to see why they are so attractive to Houzzers — they are pure fantasy and make you want to dive right in. And there are plenty of features to note if you are considering installing a pool. While not so long ago your choices were basically rectangle or kidney with a Tiffany blue bottom, now there are many options, such as Baja shelves, submerged seating and infinity edges, as well as extensive lighting, shape and color choices. Here are the 11 most popular pool photos uploaded to Houzz from April to June this year, as measured by the number of people who have saved them to their ideabooks. In the past 30 days, 4 new properties have come on the market in Bay Ridge while 1 property sold for $1,605,000. Currently there are 13 homes for sale in Hillsmere Shores ranging from a resort-like waterfront home gorgeous water views of Duvall Creek listed for $1,399,000 to a 3 bedroom, 1 1/2 bath ranch style home listed for $345,000. In the past 30 days 11 properties have sold in Hillsmere Shores.